Those following on Facebook (and sometimes Twitter) know that right now publicity for the paperback of Enchanted is the LAST thing on my mind right now, as my niece undergoes a very dangerous heart surgery up in Burlington, VT. But, as my very wise and significantly more published friends have reminded me, the publishing machine does not stop for us, or our troubles. I appreciate all the efforts of fellow bloggers and podcasters to help further the sales of my books — I implore to you check out all of these things, and enjoy! 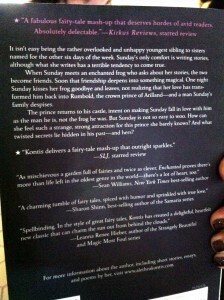 * The Regency Inkwell posted a fabulous interview with me about Enchanted and my writing process. Read that here. * I completed a very long (and very fun!) interview on Kids Books Ink…and they published it almost immediately. Thanks, guys! Check that out here. * And just in case you haven’t purchased a paperback copy of Enchanted for yourself and your ten closest friends, you can just follow this link here and take care of that. This entry was written by Princess Alethea and posted on June 5, 2013 at 4:32 pm and filed under Enchanted, Interview, Podcast. Bookmark the permalink. Follow any comments here with the RSS feed for this post.